So you know you’ve officially become a gardening person when you can stand in the seed aisle at Wal-Mart for over 30 minutes, and still not decided what to get! After working on my garden plan (post coming soon!) I determined what new plant varieties I wanted to try this year. New to my garden will be watermelon and cantaloupe. I’m hoping to trellis them–anybody have any experience with this? The first year I planted pole beans, a huge space saver. But I hated the beans. So last year I converted to bush, and will do it again this year. I’ve had miserable results with my cucumbers, so I’m experimenting with a new variety. 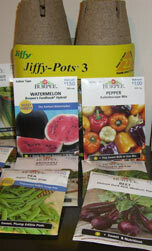 I’m planning on starting some things from seed–tomatoes, peppers, broccoli, and cabbage. Last year I did cauliflower, but it didn’t yeild much and took up a lot of space. So no more cauliflower! I also decided that starting onion seeds is not for me–I prefer the sets. I had TONS of peas last year (it was a really cold spring and the peas grew until July! ), so I’m planting two varieties this year. 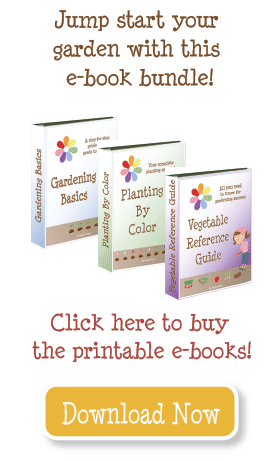 I’m new to square foot gardening this year and am so glad I found your site! It has helped me so much already! I’m wondering if you can help me, though. I bought pumpkin, watermelon, and zucchini seeds. Can I plant them in my SFG? I have plenty of room for the vines to run wild outside of the box. Do you think that would work if I plant them on the edges? Thanks for all of your help and information! I grew one plant of Tendergreen Burpless cukes on a 4 ft tall trellis last year and had more cukes than the wife and I could eat!!! They are absolutely delicious, but don’t keep well and picking is not recommended. I found a bunch of metal poles and plastic corner joints in the woods – looks like tent poles or something. I drove a couple of those in the ground, connected a piece across the top, and made a net out of nylon twine. Worked like a charm! I will do more this year along with some pickling cukes, squash and zucchini. I may even try some vertical cantaloupe and use cheese cloth (cheaper than pantyhose) to support the fruit – same with winter squash. I may have to give the “slanted” trellis a try – with the climbers (cukes, squash, etc) on the West side and leafy veggies underneath and to the East. The hot afternoon sun is what does the most damage. The key to pole beans is to pick them before they get too big or lumpy. I grew Kentucky Wonders last year and as long as I picked them by the time they were about 6″, they were tender and delicious. Still have some in the freezer. I am trying Kentucky Blue (cross between Kentucky Wonder and Blue Lake) this year. Most people consider pole beans to be sweeter and more tender than bush beans. And they are easier to harvest and have a longer growing season. Just don’t let them get too big. Frequent harvesting will spur increased production so you don’t sacrifice yield. Try the Armenian cucumbers…TERRIFIC! And…we did a little space-saver deal. I had my husband build a frame about 2X3 feet, covered it with strong netting (like bird netting or you could use chicken wire) and then attached 2 legs (2X4’s) on the long corners so it stood up slanted. We planted lettuce UNDER the frame so it still got water and sun through the screen & had head space to grow AND then planted the cukes on the outside of the frame, trained them to grow over the screen, providing shade for the lettuce. Worked great! i read that most vine plants profit from being grown vertically. it helps the fruit grow uniform and air circulation is improved, not to meantion the amount of space you save. it also prevents the fruit from rotting on the ground or getting attacked by slugs and snails. another thing i learned is that if the fruit gets too big (especially in the case of heavy pumpkins) you can make a little hammock for them out of netting or old nylons. although i haven’t tried this yet, i’m going to be growing pumpkins and squash vertically this year (as well as cucumbers and other vine plants), and probably not feeling too bad about getting runs in my nylons either… sounds like a good summer plan to me! I’ve grown cantaloupe on a trellis several times with great success. I garden in 4×8 boxes that I’ve built with landscape timbers (about 3 deep) and filled with lots of good soil and compost. I’ ve always used one of the boxes next to my cedar fence and the fence helps keep the trellis sturdy. I hammer 3-4 of the 2.5 inch squared 6 ft. wooden poles spaced equal distances apart into the garden soil. I then stretch nylon netting across the poles and staple them around the end poles and then staple the top and ends of the netting to the fence also. I plant the cantaloupe in about 2-3 mounds in front of the netting. The vines grow up the trellis and as the fruit develops and starts to get heavy, I use old pantyhose to make a sling or hammock for the cantaloupe. This way the fruit won’t fall off the vine before it ripens. Another good thing to do is scratch cottonseed meal into the soil around your plants about every 2-3 weeks and water it in. Cantaloupe need regular watering while they are growing, but once your fruit is a good size, it’s a good idea to taper off a little on the water. This produces really juicy and sweet melons. Good luck! Growing cantelope vertical is great!! As they get bigger it is so fun to be able to see where they are and get a good count as to how many there are. The best cucumbers that we have tried are Lemon cucumbers. They are never bitter and grow a ton. Not good for canning. You really should give them a try. My experience with growing watermelons was similar to pumpkins. They take up a ton of room and don’t produce much fruit. I also picked mine around the end of July and it was still green, so they take a long time to ripen. I didn’t trellis mine, so that might work out better for you. Good luck! I did the exact same thing in Walmart!! Thanks for the motivation. The next step is getting my hubby to bring me home some “COMPOST” to freshen up my beds!